We had thought we might try to raise some mini's instead of full sized horses. But the economy has continued to decline so we can't in good conscience do that, no matter how much we miss having foals around. 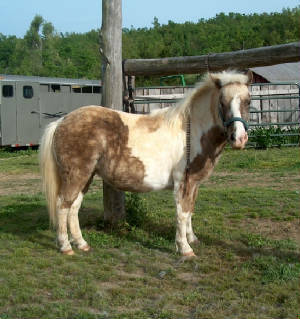 We had found a nice Smoky Cream stud, a yearling, but decided to sell him. As it turns out, Honey seems to be in foal, due sometime in the spring or early summer of '12 and we are so pleased about it. This baby can stay right here with us and be as safe as we can keep it. Honey has been a big hit at a local festival. I think every single child there came up and petted her. She is a rare jem. They share a field with a few milk goat does and our first kid, now a wether.